DFDS is Northern Europe’s largest shipping and logistics company. The company’s name is an abbreviation of Det Forenede Dampskibs-Selskab (literally The United Steamship Company). Det Forenede Dampskibs-Selskab was formed on 11 December 1866 as a merger of the three biggest Danish steamship companies under the leadership of Danish financier Carl Frederik Tietgen. Operations began on 1 January 1867 with 19 ships with Copenhagen as the main starting point. The company’s routes at the time were from Denmark to Norway, the Baltic, Belgium, the United Kingdom, Iceland and The Faeroe Islands, with ships carrying both freight and passengers. After continued expansion of the fleet in the 1880s, DFDS became one of the world’s ten largest ship-owning companies. 1964 saw the introduction of the first ro-ro passenger ferry, when the ‘MV England’ entered service on a route connecting Esbjerg to Harwich. . In 1982 Tor Line and Prinzenlinien were acquired. In 2005 DFDS Seaways acquired the Newcastle-Bergen route from Fjord Line. In September 2008 DFDS closed the loss making Newcastle to Bergen route. In July 2010, DFDS acquired Norfolkline from Maersk. The Norfolkline routes and vessels were integrated into DFDS Seaways. Maersk received a 31.3 percent stake in DFDS as part payment. After a two-year lock-up period of the shares they were sold in September 2013. In December 2010 DFDS sold the Irish Sea operations of the ex Norfolkline (Belfast – Liverpool and Belfast-Heysham) to Stena Line. In June 2001 a deal to acquire a 76.36% shareholding in the Lithuanian shipping company LISCO was finalised. The operation was rebranded as DFDS LISCO. In February 2012 DFDS and LD Lines started a joint service between Dover and Calais and formed DFDS Seaways France by merging certain LD Lines and DFDS Seaways routes into the new company. The routes involved were LD Lines Portsmouth-Le Havre and Newhaven-Dieppe routes and DFDS Seaways Dover – Dunkerque route. DFDS Seaways France was 82% owned by DFDS with the remaining 18% owned by Louis Dreyfus Armateurs (LDA). LDA sold their remaining share in the venture to DFDS in late 2014 and the venture became fully merged into DFDS. The Harwich – Esbjerg route was closed on 29 September 2014 due to a downturn in passenger numbers. The Harwich – Esbjerg route had operated since 1875. This was the last service operated by DFDS from Harwich and was also the last passenger service between Great Britain and Denmark. 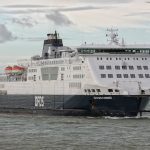 In October 2014 DFDS extended its operation contract for the Newhaven-Dieppe route with Syndicat Mixte de Promotion de L’Activité Transmanche (SMPAT), for a further year to secure the service, and this was further extended in May 2016 for four years until May 2020. On 31 December 2014, DFDS closed the Portsmouth-Le Havre route due to continued losses. On 8 June 2015, Eurotunnel announced that their lease of the ships to SCOP SeaFrance (trading as MyFerryLink) would not be extended with Eurotunnel entering into a lease-buy deal with DFDS to acquire the ships for the Dover-Calais route. Today, DFDS operates a network of 25 routes with 50 freight and passenger ships in the North Sea, Baltic Sea and the English Channel. In 2016 the company celebrated 150 years of operations. MV Baie De Seine ex Sirena Seaways, Dana Sirena, Golfo Dei Delfini – Steel twin screw motor vessel built in 2002 by Stocznia Szczecinska , Stettin, Poland (Yard No B591-1/2) as a Passenger Roll on – Roll off cargo ferry.